Founded in 2006, Twitter is one of the leading social networking sites in the world based on active users. The social networking service, known for its short 140-character messages, is headquartered in San Francisco, California. The number of Twitter users worldwide is projected to grow from about 258 million users in 2015 to nearly 370 million users by 2020. In regards to regions, Asia Pacific and North America are the most important markets for Twitter, as these regions were estimated to account for about 37 percent and 21 percent respectively of the total number of Twitter users in the world in 2016. As one of the main social media platforms in number of users, Twitter is highly used by marketers. In 2016, about 76 percent of marketers worldwide stated using Twitter to market their business – only Facebook had a higher share that year, 93 percent. About 61 percent of marketers said they were planning to increase their use of Twitter in the near future, whereas 26 percent stated they will maintain the same use of the channel in the coming years. As social media marketing gains momentum, Twitter has a challenging task to stay ahead in this market. As of the third quarter of 2015, Twitter ad engagement was up by 165 percent in comparison to the previous quarter. However, in the U.S., the figures show a different direction, particularly in terms of ad relevance and ad visibility. About 45 percent of Twitter users have said the ads that they saw on Twitter were not relevant to their interests, and only three percent believed these ads were relevant and insightful. 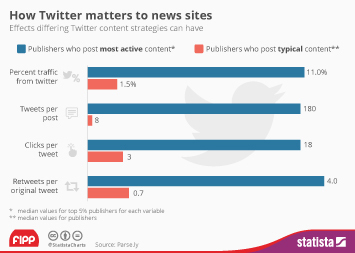 In terms of Twitter ad visibility, about a quarter of users in the U.S said they never saw ads on Twitter, while 18 percent of them stated seeing an ad every 10 tweets. These particular figures aside, Twitter’s rising popularity has begun to translate to monetary gains, seeing that Twitter’s advertising revenue is on a steady rising path. Total ad revenue is expected to amount to nearly four billion U.S. dollars by the end of 2018, a significant growth from the 2014 figure, when the company’s revenue stood at 1.3 billion U.S. dollars. In line with the overall revenue growth, mobile advertising revenue is projected to increase in the coming years. Advertising is, by far, Twitter’s main stream of revenue, followed by data licensing and others.